Today only (16/July/2018): Battleship Warspite with a 50% discount! Historically and in the game, Warspite has been celebrated as a battlefield bruiser. This ship perfectly combines impressive firepower with excellent survivability. Warspite is a true survivor that can withstand any hardships of a battle at sea. Excellent armor up to 330 mm thick. Enhanced "Repair Party" consumable. When activated, this consumable on board Warspite heals more HP per charge than normal same-tier battleships. Impressive handling for a battleship. 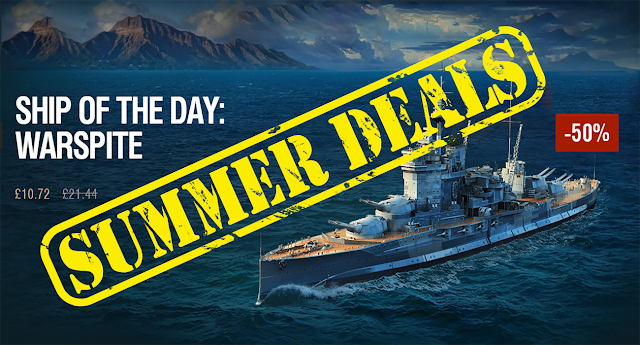 If you already have this ship in your Port, you will receive 3,250 Doubloons as compensation. See the Wiki for the performance parameters of Warspite.